Is it time to finally ditch the booze? Here we go again… we’re being told that alcohol is bad for us. Every week brings another sensational news headline telling us what we should or shouldn’t put in our bodies, should or shouldn’t do, and should or shouldn’t believe. And each new study seems to contradict the one before. But this report is a biggie. Published in medical journal The Lancet last week, it’s the culmination of 26-years of comparison between non-drinkers, moderate drinkers (up to one unit of alcohol a day) and heavier drinkers from 195 countries across the globe. And its grim conclusion is that there is no safe level of alcohol consumption. If we consume any alcohol at all, our risks of mortality increase, albeit infinitesimally. Nevertheless, the Chief Medical Officer of England is considering lowering recommended alcohol limits. Well that’s one study I won’t be raising a glass to. I’m not liking it one little bit. What about the long-held belief that a daily glass of red wine is good for the heart? Or that a cider a day keeps the doctor away? 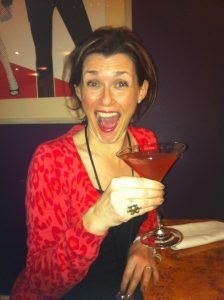 Hands up if you thought moderate drinking prevents dementia! What about all those centenarians who put their longevity down to a dram every evening? Or the headlines that tell us that gin is good for the skin? This report rubbishes all those theories and, if its fine detail is believed, we’d all be better sticking to the soft stuff. So, I suggest you gather your nearest and dearest for a final blowout this weekend, then change your ways. Open every bottle in your wine rack and on that cocktail shelf (yes – even the cooking brandy for the Christmas cake) and knock back the lot. Take two paracetamol in the morning, and once you’re safe to drive, take the empties to the bottle bank. If all goes to plan your health will improve, your bank balance will be healthier too, and you’re fractionally less likely (as a moderate drinker) to succumb to cancer, heart disease or an alcohol induced injury. There. Isn’t that better? No, of course it’s not. 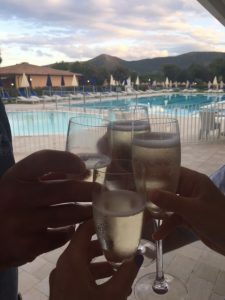 By all means if you feel the need to cut or reduce booze from your life, and this is the excuse you need to do it, then crack on – you have my full support. But if you really, really enjoy a drink with friends and family, and would be giving up purely because you’ve been scare-mongered by this latest headline, then I suggest you take it with a pinch of salt (a bit like a shot of tequila, really) and carry on as you are. I really enjoy drinking. I love a cool, crisp glass of white wine or a G&T in the garden when the sun is shining. I love getting friends and family around the table for dinner – wine is usually (always) a feature. 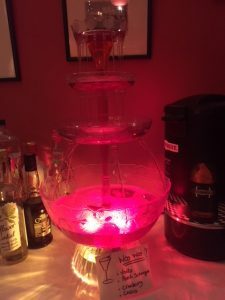 Parties are a fabulous excuse to dust down our classy plastic cocktail fountain – it lights up as it pumps out a continuous stream of Woo Woo. As the evenings begin to draw in there’s nothing finer than a glass of port by the fire, and let’s not forget my very favourite – a dram. 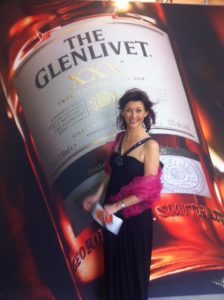 I’ve written before about my long, enduring, and ever-changing love affair with whisky and I’m gutted that a family ‘do’ will keep me from attending this weekend’s Spirit of Speyside Distilled Festival in Elgin Town Hall. Undeniably there are a few of us who could do with cutting back. It’s been a while since I’ve had a night after which I have vowed I would never drink again, but I have had those nights. And while I know they’re not good for me, they are always exceptionally good fun. And let’s face it; we all do things that are not good for us, or which increase our risk of injury or death, pretty well all the time. If we didn’t drive, there would be no road traffic accidents, yet no-one is suggesting we give up our cars. If we didn’t love the great outdoors there would be no climbing or skiing accidents, yet no-one wants to keep us from the hills. Every year, people die competing in marathons and extreme sporting events, but still we run and cycle. Life is full of risk, and it’s full of pleasure too, or it should be. Sometimes the riskiest things give most pleasure; often the risk is part of the pleasure. Thanks to this study we now know – if we didn’t know before – that drinking alcohol carries risks. I have assessed those risks, and I’m happy to keep taking them. Cheers! This post first appeared in Seven Days, published by SPP and issued with The Inverness Courier, The Northern Scot and four other titles across the north of Scotland, week ended 31st August 2018.